This DIY (do it yourself) kit will allow you to construct a 5-bell door strap using your bells. This particular design is intended for small to medium sized bells that are all the same size. See an example.... The bells should be no larger than 1 3/4" across (size #6) for best appearance and function. This strap will not work for larger bells and will look awkward with bells that vary a lot in size -- look at our other DIY straps instead. 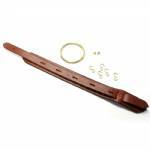 Overall length of the finished strap will be about 17 inches long, including the ring. The strap is 1 1/2" wide.